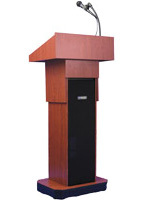 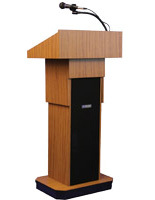 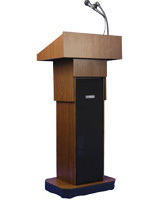 This adjustable height sound wireless mic podium offers classic, executive styling that is ideal for public use as a speakers stand in conference rooms, places of worship, boardrooms, training centers, and auditoriums. 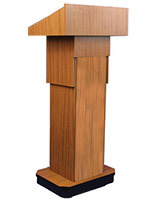 The stylish presentation lectern is made of real wood with a neutral medium oak finish laminate to complement any environment. 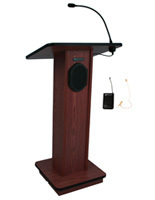 Each pneumatic adjust height sound wireless mic podium's versatile design features a built in bluetooth-compatible sound system with hands free lapel & wired gooseneck microphones, speakers, input/output jacks and much more. 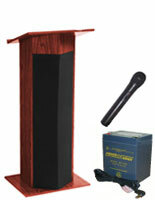 This AV accessory allows speakers to be easily heard throughout public locations. 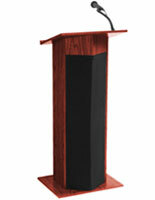 The stereo sound wireless mic podium has (4) hidden caster wheels, two of which lock, for easy mobility and stability during use. 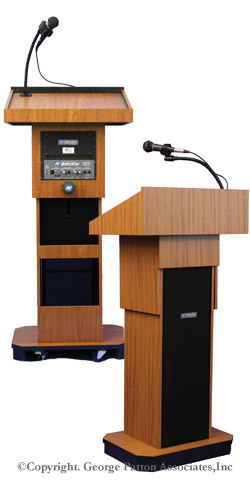 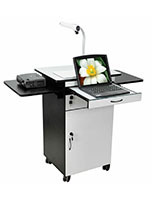 This portable pulpit's classic design and many modern usability features make it a perfect choice for any business, organization, institution or public meeting space.